did you get much accomplished this weekend? i managed to make a small dent in the blanket and have included some pictures for sewing the squares together so that the stitching is NOT the focal point. i used the mattress stitch to join them by section and it went relatively smooth. i found that i benefitted from using some knitting clips/safety pins that would help to stabilize the squares until i got to them and thus maintained even spacing. 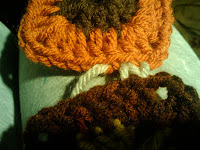 Beginning at the top right corner of the orange square, insert the needle from right to left, going under the chain and back out through the middle of the next stitch and then pull the yarn through. Now repeat that same stitching technique in the brown square, stitching in the same approximate stitch as above but don't pull too tight. Think of it as lacing your tennis shoes. Once you've stitched 4-5 stitches back and forth, pull gently and watch the yarn disappear as your two sqaures snuggle up ... not too tight, not too loose ... and your squares aren't distorted, but rather peacefully playing side by side, just like your granny would want! guess it's time to stop crocheting for a moment .. i've got a special friend waiting on a swap .... her knitted dishcloth and homemade bar of soap are calling. 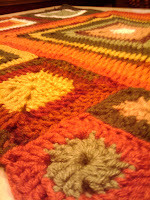 Have you checked out www.Ravelry.com yet? so many options, free patterns and new friends just waiting to hear from you.